After nearly a decade of fiscal policy taking a back seat to monetary policy, the newly elected Liberal Government moved public spending into the driver`s seat with its first budget since the election last October. Canada will now use fiscal deficits to re-invigorate its limping economy. It has launched a policy of fiscal stimulus, lead by large infrastructure investment for at least the next five years. While the political analysts argue as to which election promises were kept and which were broken, the principle issue in the budget concerns the role of deficits in generating economic well-being. Deficit financing has been used in Canada several times over the past four decades, as successive governments contended with economic downturns (Chart 1). 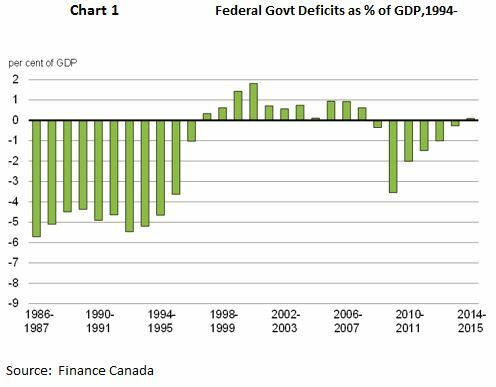 Recovery from the severe recession of 1980-82 and again in 1991-93, Canada ran very large deficits - in excess of 4% of GDP. From 1997 to 2008 government finances returned to the black, only to be hit hard with the 2008 global crisis, necessitating a return to deficits in the order of 3% of GDP . That deficit position was ultimately eliminated by 2014-15. Once again, Canada faces a very difficult economic environment and now turns to deficit financing to clear a path towards higher economic growth. When the election was called in the summer of 2015, the Liberal Party advocated deficit spending and proposed a deficit of C$10 billion in the first year. By the time the budget was delivered on March 22, 2016, the forecasted deficit was increased to C$29 billion and the Government planned to run up a total C$100 billion in deficits over the next five years. What happened in the interim between the election call and the budget delivery? According to Finance Canada documents, surveys of private sector economists taken in June 2014, indicated a relatively robust growth path. ( Chart 2). However, the collapse in the commodity markets changed everything . Forecasts were significantly lowered for nominal growth GDP, by as much as 7% for 2017. The original deficit projections could no longer be justified. The principal culprit was the severe drop in investment plans in the energy sector and its knock-on effects for the rest of the economy. Industrial sectors, outside of the energy-producing provinces, were suffering a decline in nominal incomes. Overall, capital investment in Canada has been on a decline for several years, and the collapse of commodity prices has only served to accentuate that decline. No longer can we count on the commodity sector to sustain economic growth. Canadian governments at all levels have made considerable strides in reducing debt ratios over the past 25 years. 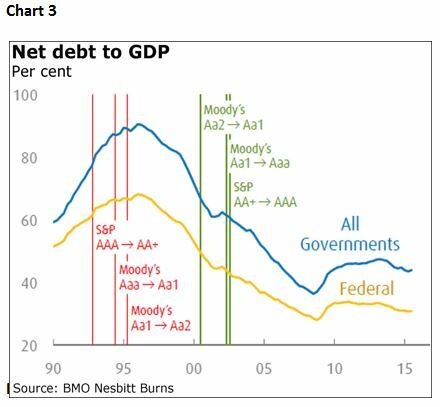 Chart 3 traces the debt-to-GDP ratio for all governments over that period. The ratio has declined from nearly 90% in the mid -1990s to under 50% today. As the deficit ratio fell, the bond rating agencies raised Canada's ratings and today the country enjoys one of the highest ratings in the G-7 countries. Within the Federal sphere, the debt-to- GDP ratio has fallen from nearly 70% in the 1990s to just over 30% today. The 2016 budget projections expect that ratio to continue over the planning time horizon. Starting in 2016-17, the deficit will be financed by a record issuance of C$133 billion of which C$92 billion is rolling over old debt from the previous borrowings and the balance represents the deficit to be financed this coming fiscal year. Interestingly, Finance Canada recommends issuing bonds in the two-, three-, and five-year borrowing periods, rather than locking into low rates for 10 - and 30-year bonds. One could argue that, given that much of the deficit arises from infrastructure investment, they should be financing with long term rates which are at historic lows. However, if the goal is to return to a balanced budget at the end of five years, then using short-term rates seems appropriate. This was the strategy of the Harper government as it sought to return to a balanced budget by 2015. Either way, today's borrowing costs affords an opportunity to expand the budget without measurably adding to the burden of interest costs. Turning to Table 1, the outstanding Federal debt will be increased by C$113 billion over the period. Nonetheless, the debt as a percent of GDP remains static at approximately 30% throughout the period. And, more importantly, interest costs as a percent of total revenues marginally increase from 8.8% in 2016-17 to 10.3% in 2021. Both measures suggest that the Federal debt position is sustainable and does not impinge on the expansion of programs designed to stimulate the economy. In the past, Canada has relied on foreign capital inflows to help finance it public sector deficits. Given the Federal Government's sound bond rating and also that Canada's offers competitive interest rates - certainly higher than those in Europe or Japan - there is every reason to expect that the international investing community will look favourably upon future bond issuances. 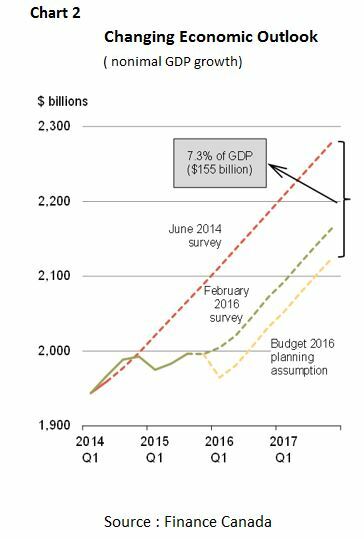 The budget has prompted many forecasters to reassess their earlier growth projections.TD Canada and BAML both bumped up their forecasts for 2016 and 2017 on the strength of the proposed budget. It is no secret that the Bank of Canada has had its hand stayed, awaiting Federal budget .This level of deficit spending will be welcomed by the Bank as a tool to augment its accommodating monetary policy. The central bank estimates growth of 1.4 percent in 2016 and 2.4 percent in 2017, in the absence of fiscal stimulus. At least, the Bank now finds it has a partner in promoting economic growth. A final word. With the EU countries under austerity regimes and the US operating with a relatively non-expansionary Federal budget, Canada now embarks upon a program of deficit financing to counter its problems of slow growth. It will be of interest to many other nations to see if this strategy is what is needed to pull out of the current weak economic environment.